Database Administrator, Programmer, Sr Technical Assistant and Project Engineer posts on contract basis. Eligible candidates apply online through NIELIT official website at www.nielit.gov.in/Chandigarh. Last date for submission of applications for NIELIT Chandigarh Data Entry Operator Job is 23-02-2017. Candidates will be selected based on previous work experience or written test, typing test and interview. 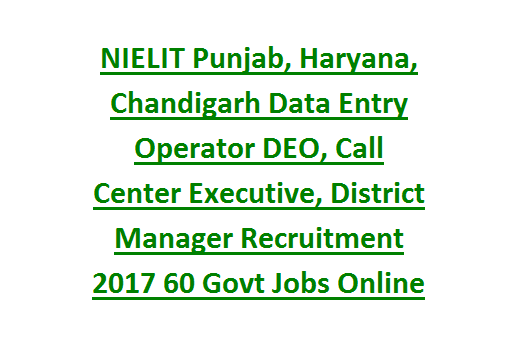 Those who are willing to work in shifts they are only suggested to apply for this NIELIT Chandigarh Data Entry Operator and Call Center Executive Posts. 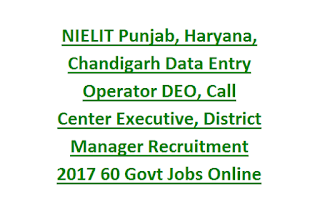 NIELIT Chandigarh Data Entry Operator, CCE Jobs qualification detail, available vacancies information is given below. There are total 60 vacancies available in this recruitment of NIELIT Punjab, Chandigarh and Haryana Centers. For post wise age limits refer official advertisement. For Call center Executive upper age limit is 30 years. For Data Entry Operator Upper age limits is 35 years. For post wise educational qualifications refer the official website of Chandigarh NIELIT. Selection for NIELIT various posts recruitment will be held through personal interview or Typing Test or Written test. Eligible and willing candidates may submit their application form online using official website of Chandigarh NIELIT www.nielit.gov.in online on or before 23-02-2017 before 04:00 PM.